Sure, split pea soup is pretty good, but Organic Green Split Peas by Arrowhead Mills don't stop there. Of course, Organic Green Split Peas can be made into a delicious split pea soup. But they also make a nutritious addition to many cold salads and can even be served as a simple side dish. Split peas have tons of fiber (4 g per serving), which can help maintain digestive health as well as contribute contribute to weight control by making you feel full longer. 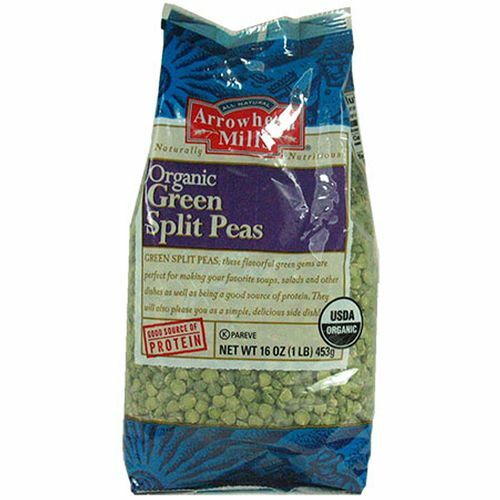 Whether adding flavor to a main dish or a side, Organic Green Split Peas by Arrowhead Mills can do the job. Order some at eVitamins today! Split peas can be added dry to soups and stews, just be sure that there is enough liquid (1 1/2 cups to every 1 cup of split peas) to compensate for absorption and expansion. Arrowhead Mills Avaliações de Clientes.